Start with your chicken. If you’re not using pre-made cutlets, place chicken breast on a cutting board and a piece of wax paper on top. Pound with a mallet until it’s as thin as you can get it (I never can get it as thin as recipes request, let’s be honest). Next, get three shallow dishes. Place flour in one, eggs in the next, panko in the third. Lightly beat the eggs. Season chicken salt and pepper, then coat each with flour, then egg, then press the panko into cutlets. In a large skillet over medium-low heat, heat enough olive oil to thoroughly coat the bottom of the pan. Add cutlets to skillet (oil should sizzle), and cook 2-3 minutes. Turn, and continue cooking until cutlets are golden brown and cooked through. Remove to a paper-towel lined plate to drain. Serve with salad topping. Add shallots, dijon, lemon juice, honey and olive oil to a mason jar, and shake vigorously to combine. Season to taste with salt and pepper. 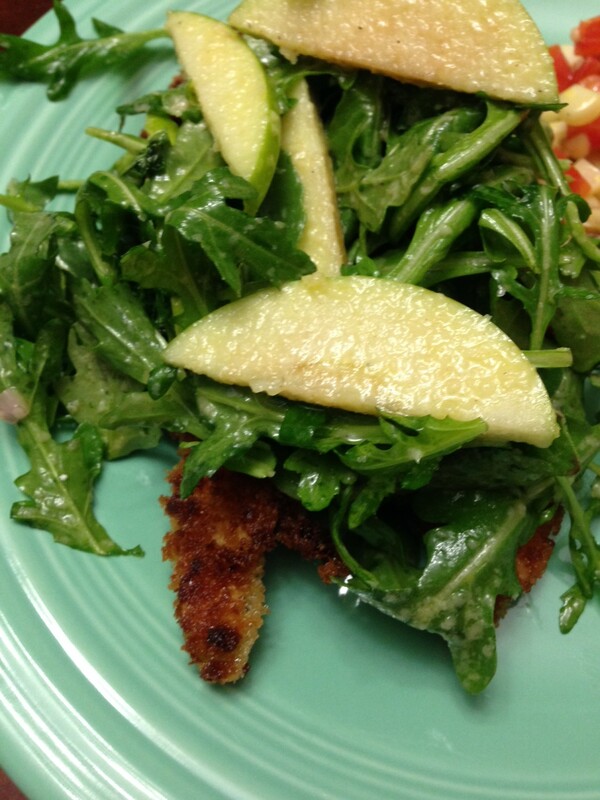 In a medium bowl, add arugula, parmesan and apple slices. Toss with dressing. Did y’all think we forgot about you?